Normal brain function is predicated upon continuous adjustments in focal hemodynamics to meet local energy demands, a mechanism that is essential to brain function. It is also likely to experience impediments during the cognitive decline associated with aging as well as neurological disorders. Despite previous research efforts, the causes of aging-related illnesses such as dementia remain unclear, and the key to preventative treatment elusive. My group is currently pursuing several research projects, two of which include vascular and structural aspects of functional connectivity and cerebrovascular reactivity. One intriguing aspect of functional connectivity is the spatially selective synchrony in BOLD signal fluctuations, which is assumed to be neuronal in origin. However, being an indirect measure of neuronal activity, the BOLD signal has significant cerebral blood flow and volume contributions, which fundamentally modulate the resting-state fluctuations. Without these latter measurements, the functional connectivity remains incompletely understood, and prone to misinterpretation in altered cerebrovascular health, such as seen in aging and neurodegenerative illnesses. We will utilize structural measures (e.g. diffusion-tensor and diffusional-kurtosis imaging) as well as vascular measurements (e.g. arterial-spin labeling) to investigate the origins of BOLD-based functional connectivity. We will also integrate these methods to furnish a novel approach to examining brain connectivity, involving the use of structural and functional mapping tools such as FreeSurfer and FSL. A link is found between cerebral blood flow (CBF) on the cortical surface and white-matter tissue integrity underneath the cortex. 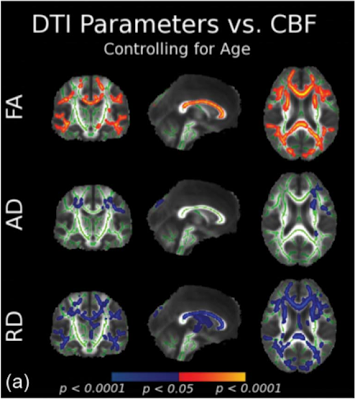 CBF is measured using arterial-spin labeling, and the white-matter integrity is represented by fractional anisotropy (FA), axial diffusivity (AD) and radial diffusivity (RD). These parameters were obtained using diffusion tensor imaging (DTI). Figure above taken from (Chen et al., PLoS ONE, 2013). Cognitive deficits characterize normal aging as well as a myriad of neurodegenerative diseases, and have been linked to cortical and subcortical tissue atrophy in a large array of populations. In abnormal conditions, it remains unclear whether an impaired capacity for blood oxygen extraction engenders in corresponding neuronal degeneration, or pre-existing neuronal damage propagates into reduced oxygen metabolism. In addition, age-associated increases in cerebrovascular risks factors, such as hypertension, have recently been shown to promote white-matter lesions and cerebral atrophy as well as cerebral microbleeds. The extent of vascular reactivity changes in normal aging have yet to be experimentally shown, as well as how such changes affect neuronal health. However, the paucity of knowledge regarding the effect of cerebrovascular status on cognitive function engenders significant impediments in the diagnosis of neurological disorders. We will develop MR methodologies for measuring hemodynamic and metabolic variables of brain function, such as vascular reactivity and oxygen extraction, and refine them for more routine use, in clinical environments. Cerebral blood flow declines in aging (from young (YA) to old (OA)). Figure above taken from (Chen et al., NeuroImage, 2011).